One of the rarest Windmill Software game, Video Trek 88 is a fun text-based game that has the honor of being the very first commercial PC game based on Star Trek series—released way back in 1982. 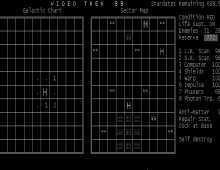 Coded entirely in BASIC, the game is similar to the mainframe Star Trek games popular in computer labs in late 1970’s. For anyone who loves the combat aspects of the series, this game proved incredibly addictive and actually quite advanced for the time it was written. The basic premise of the game is similar to plot of the very first Star Trek game that was popular in mid-1970s (freeware, run on mainframe computers). The United Federation of Planets has recommissioned you from retirement to take charge of the defensive attack against the combined forces of Romulan and Klingon Empires. For a 1982 game coded in BASIC, it goes without saying that the interface is entirely text-based, although it does not detract from excellent gameplay. After using long- and short-range scanners to detect the presence of enemies, you then select the direction to travel and the speed you want the Enterprise to use (either warp, or impulse). Once you detect enemy ships, you can open fire with phasers or photon torpedoes, but at the same time you had to keep an eye on your energy allocation. Every hit from the Klingons or Romulans drained energy from the shields, and directing more energy to keep them at full strength limited how often you could use your weapons. You can dock at any nearby starbase to replenish energy and repair ships, or even self-destruct the ship as a last resort. The game is simple, fun, and engaging. Definitely one of the worlds most historically valuable game as far as PC gaming history goes, and a must-have for every Star Trek fan. The ASCII art of the Enterprise alone is worth the wait ;) For the best version of this kind of game, I highly recommend Visual Star Trek, also on this site.